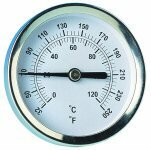 The Magnetic Bi-Metal Dial Thermometer has an inbuilt magnet to enable the bi-metal thermometer to attach itself to ferrous metal surfaces that it wants to measure the temperature of. This compact, yet effective thermometer is ideal to be used as a radiator thermometer or a pipe thermometer. Due to the delivery methods there may be some disturbance to the accuracy of the reading. If this occurs, we recommend you re-calibrate your thermometer at home. To do this, simply use the adjustment screw on the back of the thermometer to achieve the correct temperature. Bi-metal thermometers tend to need calibration more often than other types of thermometers, therefore the manufacturers make it quite easy to re-calibrate. The product was dispatched very quickly and arrived by post two days later. The thermometer is easy to read and reacts very quickly to fluctuations in temperature. Would recommend both the product and the supplier. Really pleased with the quality and clarity of this thermometer. Would recommend to anyone.